We hope everybody had an enjoyable and safe new years. We decided that we would try to find somewhere to hide from the normal hoopla and yahoo that takes place on new years eve. 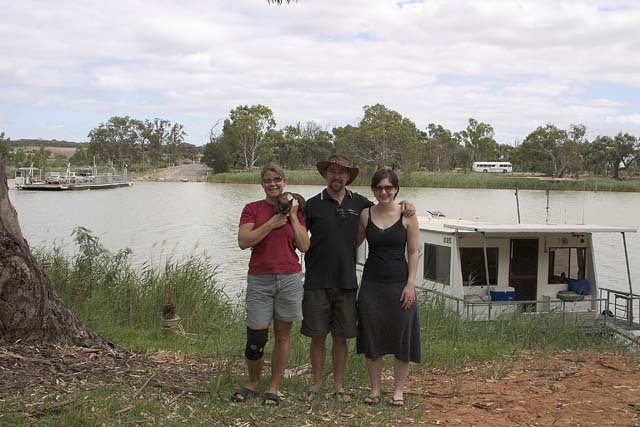 We found a great spot on Lake Alexandrina which is part of the Murray river system. It was the perfect hiding place and we enjoyed our own celebration of the new year. From the lake we followed the river through lots of dairy country and are currently parked up at Murray Bridge. This seems like a nice rural community and there are a few things of interest here. We took a walk along the river bank, not only to feed the mosquitoes, but to look at all of the river boats moored. There are quite a number of impressive house boats along the bank that make Hobohome look like a tiny outhouse. We are going to be taking photographs at a rodeo in Yankalilla on the 8th, so will tour around and follow the river for another few days. We have been pleasantly surprised by the abundance of solar power we have been able to generate down here in the south. We expected it to be difficult to keep up with our usage, but the long days mean that we are still able to get some charge as late as 7:30 - 8pm and power has never been an issue. The Travels Page has been updated and shows our progress through South Australia. We are back in Adelaide now and are getting ready for our next visitor - Zoie. 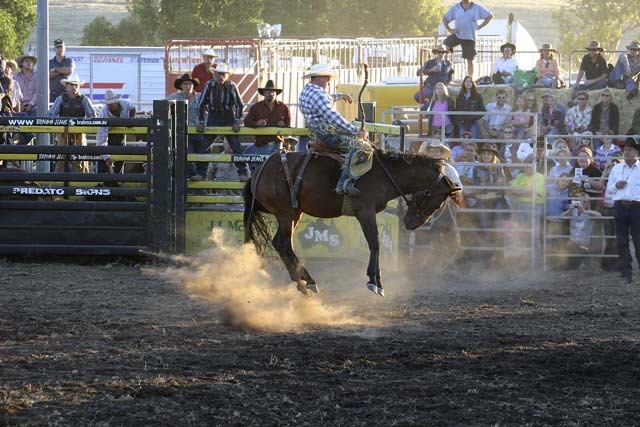 After spending a few more days following the Murray River (where 2,723,344 flies seemed to be following us) we made our way to Yankalilla for the Rodeo. That was hard work but all good fun and we met some nice people there. Once again we learned a more few things and will be ready to put a few changes in place before the next event. We had the last of the old tires replaced this week - that makes 7 new tires (including the spare). As we could not find a tire to match the front steer tire we have shuffled them around and now have two new Bridgestones on the front. We hope she will steer a little better with these tires on. We also had two of the injector sleeve replaced as there was a slight coolant leak. The good news is that the oil pressure issue we had turned out to be just a gauge problem. We replaced the pressure sender unit and all seems well - phew! For those of you who have not been to South Australia at this time of the year - let us tell you that the weather is very strange. One day is clear and 42 degrees and the next will be overcast and 18 degrees. We like a bit of a change every now and then - but this is ridiculous - it makes Auckland weather look predictable! Victoria! Yes we are now in Victoria - but more on that later. We retrieved Zoie from Adelaide airport bright and early on Friday morning and headed for the hills shortly after lunch. She is in serious need of some sun - being currently four shades paler than milk. 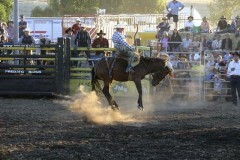 We are heading for a rodeo at Berri. After checking the weather forecast for Saturday we decided to skip the rodeo, they are predicting rain for most of the state. That gave Zoie an opportunity to sleep in and recover from her long days travel and uncomfortable night sleeping at Sydney airport. By Sunday we were camped by the Murray river at Walker Flat - a nice quiet camp until 4am when the music from the next camp dragged us into a reluctant consciousness. While exploring just a few km's down the road we found a delightful (and happily, deserted) camping area and so just had to stop there for the day and night. Tracey caught a (smallish) fish that turned out to be a carp - these are a pest and can not be returned to the river. Tivoli (the cat) had fish for dinner! We have made an appointment with VicRoads in Mildura to (hopefully) have both the motorhome and the moke re-registered in Victoria. Victoria has no annual inspection requirements for any vehicles making life and planning a little simpler. So - here we are in Mildura, Victoria hoping that we have all the requirements (whatever they may be on the day in question) to complete the transaction tomorrow. We have found a great camping area, not far from town and right next to the river. Zoie had almost gotten over her fear of everything that crawls here, when a tiny shrimp nipped her toe while standing in knee deep water - the scream was heard in Queensland! She is also tanning up like a native and will probably be several shades darker than us by the time she boards her plane for the trip home. Update 19-01 The Vic Registration is complete - we are officially Victorians! (or Mexicans to the rest of Australia). It was quite a drama, with the rules changing with each person that we spoke to - (just the normal Gvt Dpt stuff) - our saviour was an old engineering document that showed that the motorhome had once been registered in Victoria and contained the original registration number. Without that we would have been in for a full engineering report (starting price $500). With brand new shiny Victorian plates we left Mildura and followed the river back towards Adelaide. We even crossed the river from time to time via ferry - something we would never attempt before the air-bags were fitted to the back suspension. There are some truly fantastic camp areas along the banks of the Murray River and this is definitely the time of the year to explore them. The weather has been fantastic, with warm sunny days and pleasant evenings. Zoie continues her transformation from "Southern-girl-white" to "Hobo-brown" (with just a tiny touch of "Too-much-sun-Red"). We are planning to be back in Adelaide for Tuesday the 25th so that a full day of shopping can be completed before the Australia Day holiday on the 26th. We have decided to have the buses injectors cleaned and set before leaving Adelaide. The motorhome is becoming increasingly reluctant to start in the morning and a passing S.A. police car reminded us via UHF of the quantity of black smoke we are currently exhausting. We are also going to have someone look at a bearing on the main fan - it seems a little rattly. While on the subject of vehicle maintenance may I pass the comment that while we have had a fairly expensive time in recent months, it does not come as a surprise and is is certainly not viewed by us as a major issue. We were well aware that we purchased an older vehicle and that it was going to cost money to keep running. It makes sense that the tyres would fail in quick succession as they were probably all fitted at the same time (perhaps 6 or more years ago). Rest assured - we are by no means discouraged, we are still very much enjoying the life style and the adventure and we are looking forward to the challenges and fun that the next 12 months will undoubtedly bring.